Perfect for minature, small and toy dogs. Customers testify that Staglers are safe, satisfying and impressively long-lasting. Quick easy click-to-buy service to your door, try today. So how big are they and what are they made of? 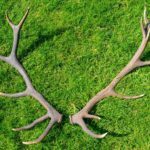 Because we only use the best, top quality, ‘Grade A’ naturally cast deer Red antler they are rich in colour and and packed with great minerals. Guaranteed, premium quality antler which is naturally shed from wild deer annually. As a result all of our stock is ethically sourced from totally wild free roaming deer ensuring sustainability. Staglers 100% Natural Deer Antler Dog Chew – Small will weigh between 50 and 75 grams. They are totally natural – unprocessed, clean, nutritious and recommended by vets. For more information please refer to our click posts page. First of all, historically in nature, wolves and other canidae, after a meal, chew on the skin and bones to maintain a healthy digestive balance. Also during mastication endorphins are produced in the brains, these provide a sense of calm that relaxes your dog. For our domestic dogs the “skin and bones of prey” are best replaced with clean deer antler. We know our customers and the benefits our eco-sustainable ethos brings to your decision making. Please do not let your dog chew a Stagler all day. It is very important that you monitor/supervise your dog whilst chewing and do not leave it with them for too long. After all you are giving a hard, nutritious treat! Your dog will know what to do with their treat, therefore leave it for him to work out how to enjoy it. Make sure your dog is gnawing on the antler chew and not trying to break it in half. Don’t hold the antler chew for him as this may cause him to bear down on it. Please don’t leave their Stagler outside, it’s not sticky so put it somewhere safe, where other creatures (i.e. slugs) can get to them, to safeguard your dog’s health. When is my dog’s Stagler finished? To avoid a choking risk take the Stagler away from your dog once it gets worn down to a small enough size that your dog could easily swallow.